Canada’s Gensource Potash plan to develop new potash mines in the Lazlo Area using the solution mining technique. The Lazlo Area is located in central Saskatchewan along an infrastructure corridor between the major population centers of Saskatoon and Regina. The Lazlo Area is large, comprising 123,000 acres and will accommodate several specific projects. Of the 11 potash mines in Saskatchewan, nine are conventional underground mining operations, which require underground equipment and personnel. The other two are solution mines, which involve pumping heated water through the ore body to dissolve the potash and pumping the resultant brine solution to a refinery for extraction. Solution mining is a more energy intensive process than conventional mining. Comparing 11 potash mines in Saskatchewan, solution mining’s average energy consumption was about 1300kWh/tonne and conventional mining’s was close to 400kWh/tonne. Gensource plan to mine this deposit using the solution mining process instead of the underground mining process. After evaluating multiple alternatives from economic, engineering and operation perspectives, they believe that a solution greenfield potash project makes more sense than a conventional underground mine. The solution mine can earn a IRR of 15% at the potash price of US$435/t. Whereas, potash price of US$580 is required to earn a similar IRR at a conventional potash mine. Solution mining of potash offers reduced engineering risk compared to conventional underground mining due to the flexibility of the location of the extraction well versus conventional mining, which is tied to one location for ore removal. 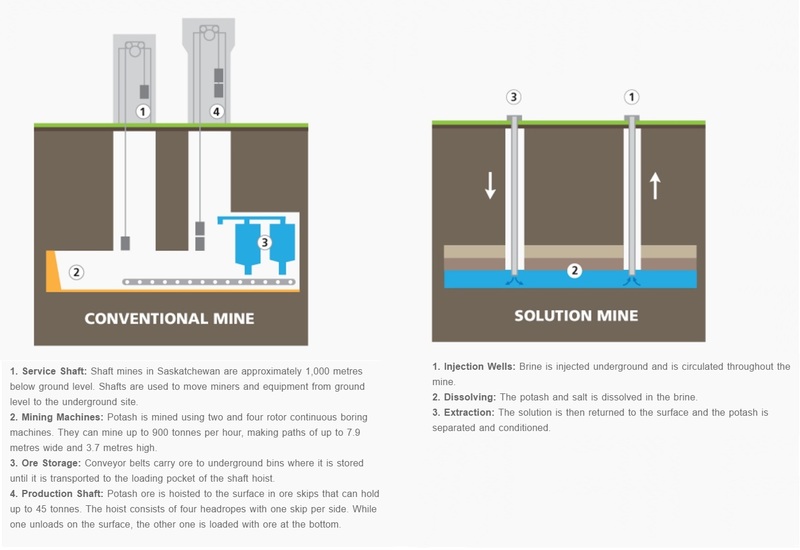 In solution mining, a number of internal and external wells are drilled, with an estimated 40 caverns required for a 2 million tonne/year mine (one cavern represents two holes). Consequently, solution mining offers the ability to move operations to other locals [e.g. to avoid geological anomalies like a “salt horst” (a salt horst is pockets, lenses, irregular beds, or channel fills that contain salt, a non-potash containing ore, within the ore bed)] for a much lower capital cost (as compared to conventional potash underground mining techniques). Gensource is generating partnerships with end-users of potash fertilizer to help them create a vertically integrated structure for the supply of potash to their agricultural operations. They have partnered with a group based in Dubai called Essel Group Middle Eas, in a venture aimed at bringing one of the junior miner’s small-scale projects through to production.